Over the past week I have been planning a film premiere, with Faction, of This Is Home. 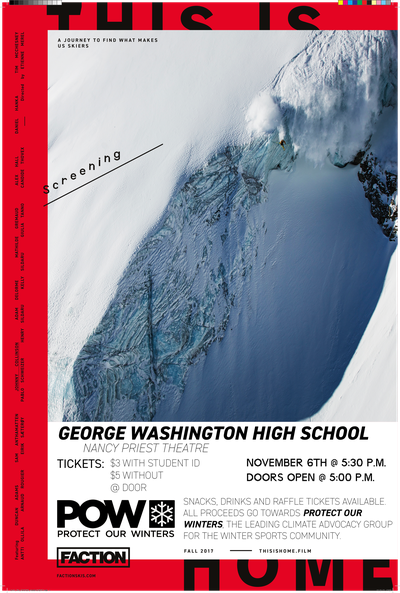 We will be hosting this premiere at George Washington High School in Denver, Colorado (located on Monaco and Leetsdale). For anyone that wants to come, it will be on November 6th, doors opening at 5:00 pm and the show starting at 5:30. We are planning on having a raffle (tickets for purchase at door) with some ski gear/tshirts/stuff up for grabs. There will also be some fun mini games, drinks, and snacks for sale at the event. Tickets will be for sale for $3 with a valid student ID and $5 without one. ALL PROFITS FROM THE SHOW WILL BE GOING TOWARDS PROTECT OUR WINTERS!!! Below I have attached a poster that has most of what you need to know. I hope you guys can all come and benefit this cause! bump this up so you guys come. There will be raffle items from Christy Sports and Faction up for grabs with purchase of raffle ticket! Super cool of you to organize a showing at your school, I tried to set one up at mine but there wasn't a whole lot of interest. Would love to come out and support but unfortunately it would be an hour drive for me. Anyway, good luck and I hope it goes well! Bring your friends! Raffle tickets will be available for purchase with faction gear and free tuneups from christy sports! All profits are donated so why not?? Damn right! Hope it'll be a fun evening - thanks for screening our film!